Budget-minded book lovers no longer have to sacrifice key features to save money. Amazon’s All-new Kindle brings its entry-level e-reader out of the dark ages. 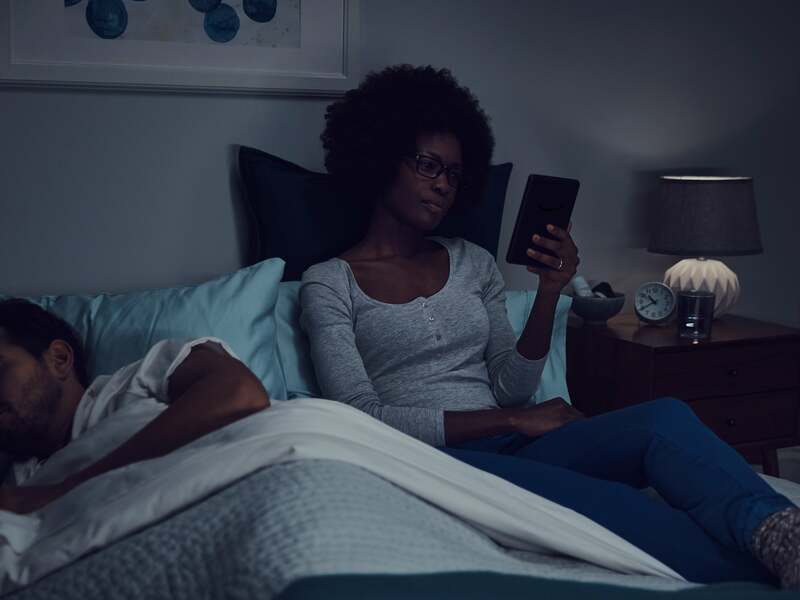 With the addition of glare-free, adjustable front lighting, it allows users a more comfortable reading experience day or night without having to spring for the higher-priced Kindle Paperwhite or the luxe Kindle Oasis. 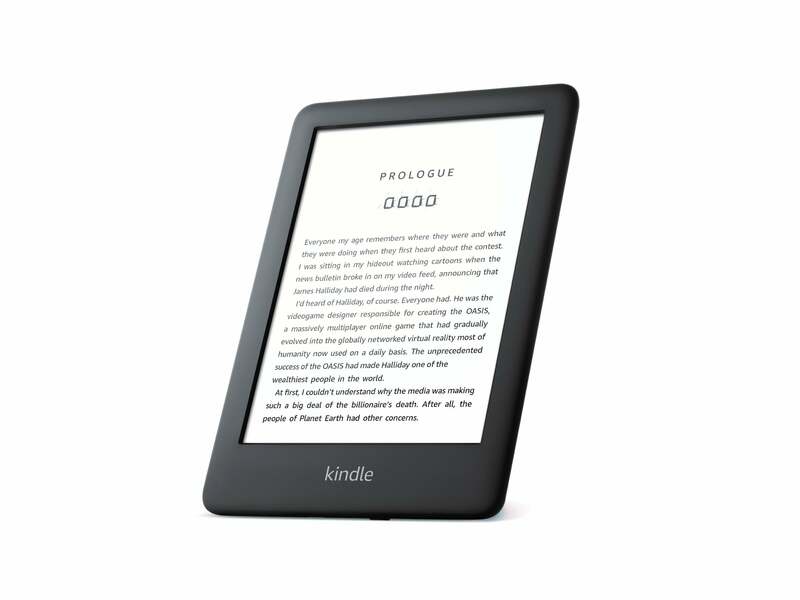 The All-new Kindle replaces the 8th generation Kindle e-reader and retains many of its slimmed-down specs. It does, however, introduce a few upgrades including improved E-Ink technology and a capacitive touchscreen. With special offers—i.e., ads—enabled, it costs $89.99, a $10 increase over the prior generation. Without special offers it’s priced $109.99. Special Offers: Save $20 if you allow ads to be displayed on your lock screen, or pay $20 if you don't. A three-month trial of the Kindle Unlimited service (access to a large library of content without per-product fees) is included, and is normally $9.99 monthly. When I first unpacked the All-new Kindle, I couldn’t discern much difference between its design and my 8th-gen Kindle’s. Side-by-side comparison revealed some slight but obvious differences, though. Although they have roughly the same dimensions—about 6 by 4.5 by 3.5 inches—the older model had a fairly flat profile, while the All-new Kindle’s is more contoured. The newer Kindle is also a hair heavier than its predecessor: 6 ounces, compared to 5.7 ounces before. It’s perceptible when you hold one in each hand and gives the All-new Kindle a sturdier feel, but doesn’t negatively impact long reading sessions. Marginal though they may be, these differences mean you won’t be able to fit the All-new Kindle into 8th-generation cases (I tried). Amazon is selling cloth case covers for the new models, available for $29.99 in four colors: Sandstone White, Charcoal, Cobalt Blue, and Punch Red. The all-new Kindle retains the 8th generation’s 6-inch display with 167 ppi pixel density, but upgrades from E Ink Pearl to E Ink Carta for sharper text. It also adds a capacitive touchscreen to minimize errant swipes. Four LEDs provide even frontlighting for more comfortable reading. The big addition, of course, is front lighting, courtesy of four LEDs. If you’re keeping track, that’s one LED fewer than the Kindle Paperwhite has, and only a third of the total offered on the Kindle Oasis. They provide even illumination edge to edge on the display, though without an ambient sensor, so you have to manually adjust their brightness to complement room lighting. As the All-new Kindle still qualifies as the line’s budget model, you still get only 4GB of storage (as compared to 8GB or 32GB on the next model up, the Kindle Paperwhite). That’s plenty for a substantial eBook library, but if you also want to include audiobooks—which you can play on an external speaker using the device’s Bluetooth connectivity—you’ll find that storage disappearing much quicker. Whichever format you prefer, Kindle Store or Audible purchases are sent to the device via Amazon’s Whispersync service. Alternately, you can side-load your reading material via USB, or email it to the device using its Send-to-Kindle address. The All-new Kindle uses improved E Ink technology for crisper text. Amazon promises four weeks of battery life with a full charge, the same as the 8th-generation Kindle. Mind you, that’s based on a half-hour of reading per day, with wireless and Bluetooth off and the light setting at 10, which is less than half the full brightness. Outside those strict parameters, battery life will vary considerably. Audiobook streaming over Bluetooth will always drain the battery faster. 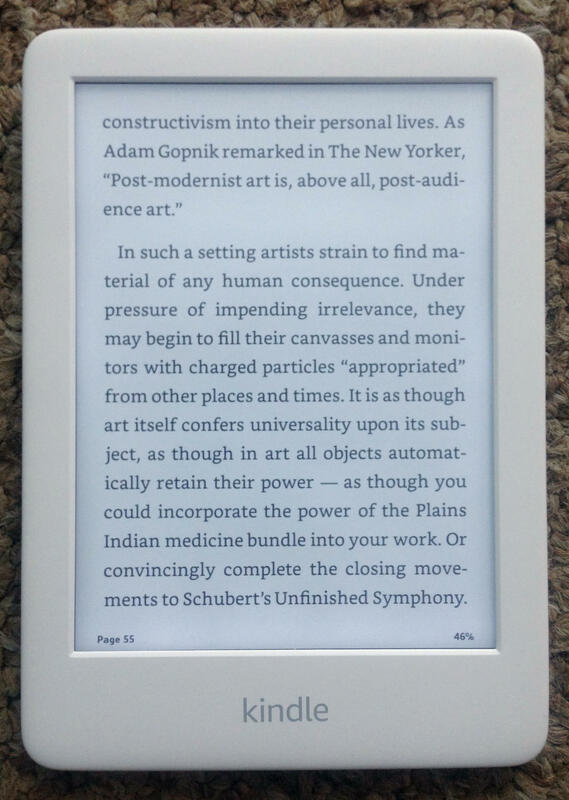 The All-new Kindle presents no particular learning curve if you’ve used the interface over the last few years. You can access the Kindle Store, Goodreads, and features like X-ray and Smart Lookup as you’ve done before. If you’re not already a seasoned Kindle user, the device surfaces tips and tutorials the first time it’s powered on, so you can quickly get your bearings. If you’ve only ever used entry-level Kindles, the most dramatic change to the user experience is the front lighting. Without it, the 8th generation and its budget-priced predecessors required you either limit your reading to daylight hours in well-lit environments or get yourself a book light (which kind of undermines the high-tech experience). The All-new Kindle allowed me to read comfortably in bed without disturbing my spouse with bright exterior lights, and had none of the eye-fatiguing effects of reading on an iPad or other backlit screen. You can easily optimize the brightness for your environment using a slider in the settings menu, which is accessible from any page of text. The All-new Kindle (right) retains much of the previous generation's specs but adds front lighting and improved screen technology. 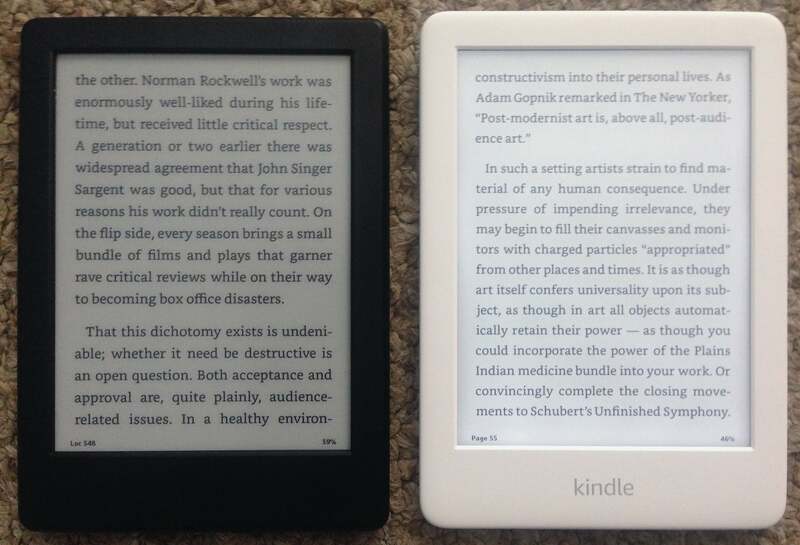 Comparing the screens of the All-new Kindle and the 8th generation, I didn’t see much of significance. The new device’s E Ink Carta screen displays text against a whiter background, whereas the older model’s background is slate-gray, and that may translate to being easier on the eyes. If the text itself is crisper, it’s too negligible to notice. The only real difference I encountered is that the All-new Kindle’s capacitive touchscreen required that I use more pressure when turning pages, and they turned ever-so-slightly slower. None of this detracted from the joys of being immersed a good book. Saving money on a Kindle typically has typically meant sacrificing features that would provide the most enjoyable reading experience. That’s no longer necessary. 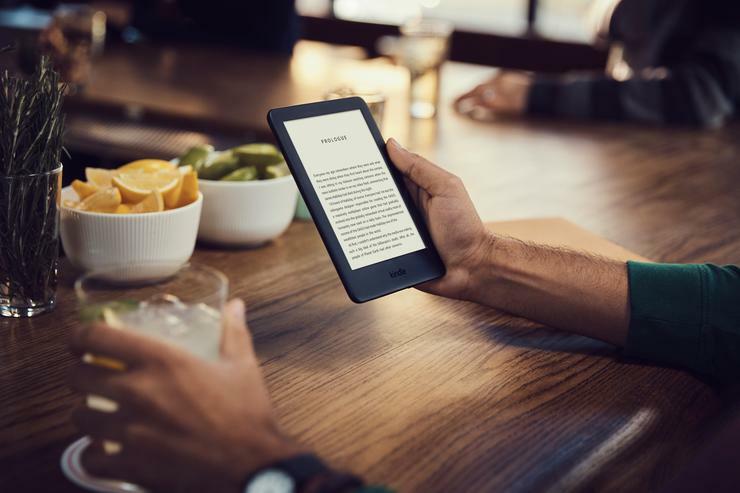 With its adjustable front lighting and upgraded screen and E Ink, the All-new Kindle finally opens the full Kindle experience to budget-mined book lovers.